Don’t forget our deadline for Re-Enrollment is February 19. Beginning in February, we will review classroom enrollment number and waitlists for grades could be created. Re-Enrollment must take place online through PowerSchool. If you have trouble re-enrolling your child, please contact Cara Miller, at cmiller@clarksvilleacademy.com. Financial Aid applications are due March 1. 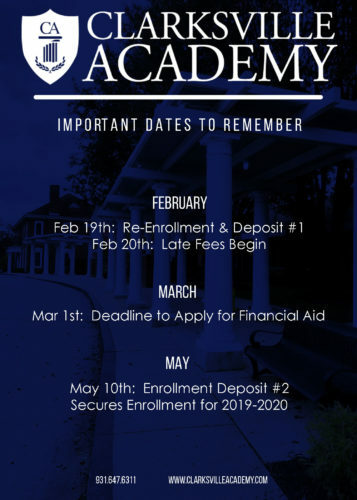 Financial Aid will be awarded on a first come, first serve basis this year and review of applications will begin this week. We encourage everyone wanting financial aid to apply now. All current PreK students and parents are invited to a Kindergarten preview on Monday, February 4 at 3:00 P.M. This event will give you a sneak peek into our Kindergarten program. Join us for refreshments, class tours, and important information about the 2019-2020 Kindergarten year. Our annual White Columns magazine is here! It should arrive in your mailbox this week. We have lots of extra issues and need your help! If your place of business would be willing to display our magazine in their lobby, please contact us! We would like to place 3-5 copies in a variety of businesses in town! Contact Rebecca Beach, at rbeach@clarksvilleacademy.com to arrange for us to drop them off! Thank you! Jackson Trotter competed in the 2019 Regional Leadership Conference for FBLA (Future Business Leaders of America). Jackson placed 1st in our region and he had the highest score across the whole state of Tennessee on the Introduction to Financial Math test. Cupid Grams go on sale Feb 5 for $1. Send your favorite Cougar a Cupid Gram today! See Mrs. Turnage to purchase. The Intermediate School boys’ varsity team won the championship of the James C. Haile State Tournament. Great job by this team! This week is our District Tournament! Join us Tuesday, February 5 when the girls compete in the first round of the District Tournament. Game begins at 6:00 PM on Procter Court. On Wednesday, our boys’ team will also play at 6:00 PM on Procter Court. We will host the District Tournament this weekend. Make sure to follow us on social media for up to date game times. Reminder—Sports Passes are not eligible for the District Games. Game tickets are $5 at the door. All Items in the Cougar Store are 50% off! Lots of Adult Small and Mediums left. If you say you saw this in the newsletter, you will get an extra discount at check out. Go Cougars!!!! We are excited to announce a new conservation program at our school called Crayola ColorCycle – an amazing program devised to repurpose used markers rather than sending them to landfills. All around Clarksville Academy, students and teachers will be collecting used markers, highlighters and dry erase markers in drop-off boxes. Please help support our efforts by sending in any used markers you may have around the house- even non-Crayola brands. Thank you in advance for participating and furthering our school’s conservation efforts! We have many ways to give at Clarksville Academy. One area of giving is the Clarksville Academy Foundation. The CA Foundation was created in the summer of 2018 and incorporates our endowed funds. Endowments like Procter and Dan Burden Scholarship are now part of the CA Foundation. On January 12 we hosted a Leanne Morgan Comedy Show with all proceeds benefiting the CA Foundation. I’m happy to announce that was raised $17,938 at this one event! Foundation funds must reach a specific level, determined by the Foundation Board before any monies are spent. Upon maturity, only the interest from these funds will be used. If you have any questions about giving, please contact Sally Allen at sallen@clarksvilleacademy.com.